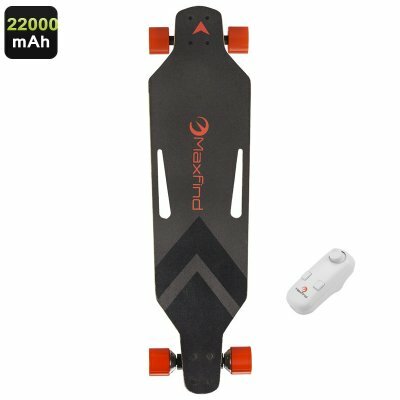 Successfully Added Maxfind Electronic Skateboard - Wireless Remote Control, 360W Motor, Up To 28KM/h, Max Load 100KG, 22000mAh Light Weight Battery to your Shopping Cart. The Maxfind electronic skateboard comes with a 12 months warranty, brought to you by the leader in electronic devices as well as wholesale electronic gadgets.. Battery life depends on factors such as the weight of rider, terrain, inclines and speed of travel. Use responsibly and take safety precautions such as wearing protective clothing and equipment. Read and follow safety guidelines in the manual, not recommended for young children. Arabic: - لوح التزلج الإلكترونية - Chinese Simplified: - 电子滑板 - Czech: - Elektronické Skateboard - Dutch: - Elektronische Skateboard - French: - Planche à roulettes électronique - German: - Elektronische Skateboard - Hebrew: - סקייטבורד אלקטרונית - Hindi: - इलेक्ट्रॉनिक स्केटबोर्ड - Hungarian: - Elektronikus gördeszka - Italian: - Skateboard elettronico - Japanese: - 電子スケート ボード - Korean: - 전자 스케이트 보드 - Malay: - Pemotong elektronik - Norwegian Bokmål: - Elektronisk Skateboard - Romanian: - Skateboard-ul electronic - Russian: - Электронные скейтборд - Spanish: - Patín de electrónica - Thai: - สเก็ตบอร์ดอิเล็กทรอนิกส์ - Turkish: - Elektronik kaykay - Vietnamese: - Điện tử Skateboard.